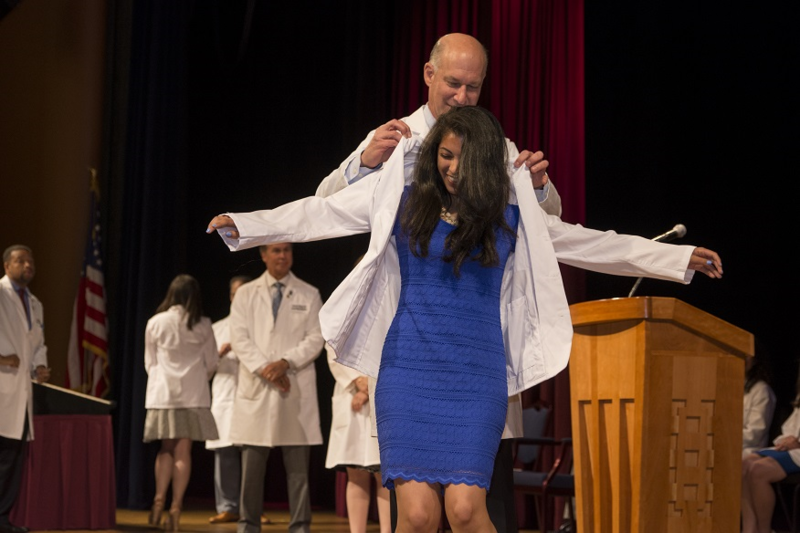 The annual ceremony, signaling the start of medical students’ education, is a rite of passage for budding health professionals; they formally don their white coats, sign the honor code, and pledge their commitment to medicine, with family, friends, and future colleagues as witnesses. For Mancera, the ceremony symbolized the culmination of years of hard work. “This has been the last eight years of my life, trying to get to this point, and it feels like a dream that I really don’t want to wake up from,” she said. What Gaba found was that the coat was merely emblematic of who she was a doctor. “I have come to learn that it’s what’s inside your white coat — behaving civilly, treating others with respect and concern — that matters,” she said. With Gaba and Kurland’s words in mind, the nearly 200 members of the Class of 2020 ascended the stage. While Rhonda Goldberg, M.A. ’77, associate dean for student affairs at SMHS, and Diane McQuail, M.A., associate dean for admissions at SMHS, introduced each student, Jeffrey S. Akman, M.D. ’81, RESD ’85, vice president for health affairs, Walter A. Bloedorn Professor of Administrative Medicine, and dean of SMHS, eased them into their white coats. After signing the pledge and shaking hands with Gaba; Lorenzo Norris, M.D., assistant dean for student affairs and assistant professor of psychiatry and behavioral sciences at SMHS; and Lawrence “Bopper” Deyton, M.D. ’85, M.S.P.H., senior associate dean for clinical public health, students and their family and friends cheered.